A distress signal on the edge of inhabited space. A mission that is far outside normal parameters. Two very different people with one common goal - survival. When a distress signal is received from a black-ops space station on the edge of inhabited space, Captain Saul Harris of the UNF Aurora is called in from leave to respond. But the mission is not what it seems. Female members of the United National Forces have not been allowed to travel into the outer zones before, but Harris is ordered to take three new female recruits. For Corporal Carrie Welles, one of the Aurora's new recruits, her first mission into space seems like a dream come true. Determined to achieve the success of her father before her, and suddenly thrust into a terrifying mission, she must work with her new captain and the strained Aurora crew to make it home alive. When the Aurora arrives at the station Harris and Welles soon find themselves caught up in a desperate fight for survival. Station Darwin is not what they expected. The lights are off. But somebody is home. Aurora: Darwin is the first in a science fiction series by Amanda Bridgeman. I feel like I've been a fan of this series since before I read it. Book 3 Aurora: Meridian was available on Netgalley so I bought the first two to get ready for the third but instead of reading them, I put them away, then bought Meridian, tucking it away as well. That was months ago. I didn't start them until a week ago since I was waiting for the 'right time' like waiting to enjoy good chocolate, coffee, bubble bath or a really fine pen. I didn't want to finish them and be in that place where I couldn't read them again for the first time. So with book 4 out in a few of weeks I took the plunge and devoured all three in a matter of days. Darwin juxtaposes its two main characters, Welles and Harris, in terms of rank and gender. The biggest challenge for Welles is the simple fact she's a woman. Her presence and that of the other two women on the Aurora is treated as a joke by the existing crew, a fact that doesn't sit well with her. I was engaged and angry for Welles since I know full well what it can be like to have to work twice as hard for half the respect. Wait, did Ms. Bridgeman just knock me out of my 'sci-fi females are just as bullet proof as the men so don't even think about making me imagine myself as anything less' fiction comfort zone? As a forty-something woman, I realized my escapism reading allowed me to avoid the realities of many women in service everywhere, even in the fictional future. That isn't to say I don't completely enjoy immersing myself in a story in which I can imagine myself as something I'm not (it's why I read fiction, after all.) But I suddenly found myself identifying with a female lead in a whole other way. She isn't super-tough, indistinguishable from the men except for the fact her 'plumbing' is indoors and their's is outdoors. Welles is a woman and she's strong; she's a strong woman. She's great. She also makes decisions I can identify with, doesn't accept that her best isn't good enough and won't stand for dismissal or BS from anyone. To me, she's believable and real and the heart of the story. Captain Saul Harris is the second heart but in a very different way. As the man in charge of the Aurora, he has to be. To me, he's also a strong lead even though I connected more with Welles. I appreciated how well he could be the commander each of his soldiers needed. I also liked the rest of the crew, Doc in particular, as he weaves between Welles' perspective and Harris'. 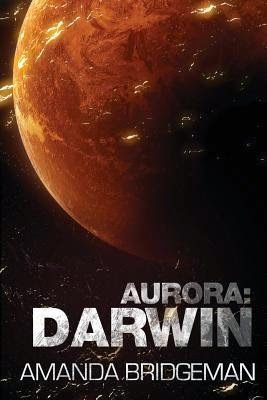 Aurora: Darwin combines science fiction, adventure and action through the lenses of both the bottom ranks and top ranks of Aurora's crew. As the mysteries of Darwin Station reveal themselves, Ms. Bridgeman challenges the developing bond of the crew with mystery, violence and the dark side of the UNF. I loved this great start to the series.